Mr. Freeze was originally painted light blue. Mr. Freeze was originally scheduled to open for the 1997 season with the release of the Batman & Robin movie. Arnold Schwarzenneger and George Clooney were even slated to be the very first riders. Unfortunately, do to issues with the LIM launch system, Mr. Freeze did not open until the 1998 season. In 2002, the over-the-shoulder restraints were replaced with a lapbar/setbelt restraint system, drastically improving the comfort of riders. Mr. Freeze at Six Flags Over Texas isn't the only Mr. Freeze roller coaster in existence. Six Flags St. Louis located in Eureka, Missouri has the exact same model of the ride. The Mr. Freeze at Six Flags St. Louis, however, is a mirrored version of the one at Six Flags Over Texas and does sport its own paint scheme. Mr. Freeze at Six Flags St. Louis. In 2012, both Six Flags St. Louis and Six Flags Over Texas decided to shake things up by flipping their Mr. Freeze trains backwards. On May 12, 2012, with the help of Vanilla Ice, Six Flags Over Texas officially opened Mr. Freeze: Reverse Blast. In present day, Mr. Freeze is still operating in this fashion, creating thrilling experience. The opening of Mr. Freeze is delayed after problems with the ride’s LIM launch system. Mr. Freeze is closed most of the season to reprofile the ride’s trains. In December, Mr. Freeze is repainted from light blue track and supports to red track and blue supports. Mr. Freeze: Reverse Blast is introduced and the ride’s trains are reversed. Mr. 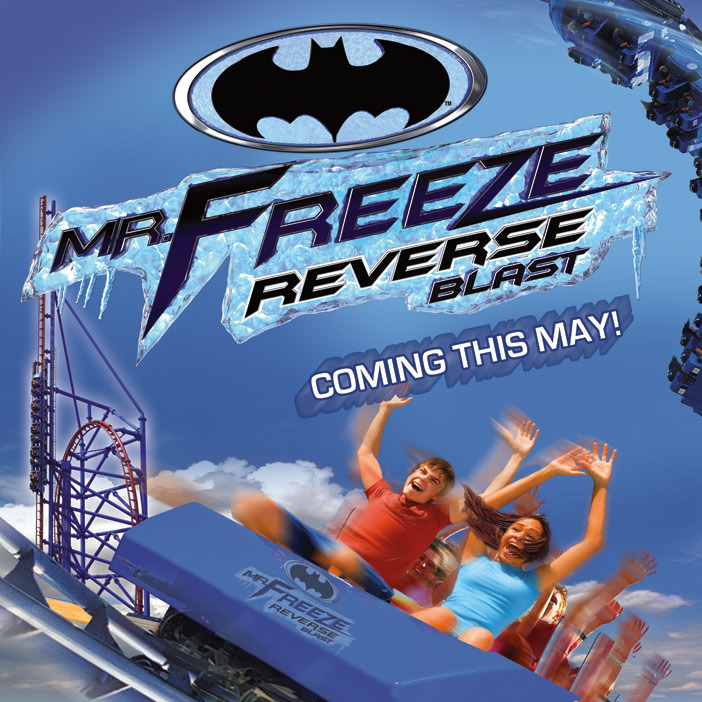 Freeze receives a third train from the Robin side of Batman & Robin: The Chiller roller coaster that operated at Six Flags Great Adventure from 1998 to 2007.